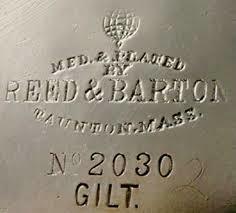 Reed & Barton was a major America silversmith in the 19th and 20th century. The company is based in Taunton, Massachusetts. The company vast products includes flatware, hollowware in both solid silver or plated. Reed & Barton. Reed & Barton is the official appointed manufacturer to manufacture the 1996 Olumpic Medals held in Atlanta, Georgia. Also throughout its history, Reed & Barton had manufactured articles used by America presidents and celebrities. 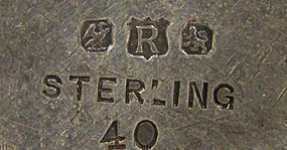 Reissued in silverplate in 1935.